Save when you buy in bulk! This stuff is awesome. The wire is as sturdy as you'd expect it to be. Makes for a super solid connection. Very good quality product - colors are clear. Good but my crimper tends to cut the sleeve off the small wires inside often. Have to watch out. Otherwise good stuff. Good quality wire easy to work with. Cable is marked with footage so you know how much is left in the box. No snagging issues in the box when pulling from network room to the second floor 70' away by myself. Nice Cat6 solid wire. Delivered on time ! This is maybe an odd review. My criticism of this cable is not based on functional quality. Rather this is the lowest contrast white color I have ever seen. More than one person mistook it as white in a job where both are being run together. This is more of an off-white color in my opinion. I would absolutely not buy this cable in this color again for that reason. It seems much lighter to me in person than the picture shows. Just a heads up for anyone looking to buy this. I can't say enough good about this spool box. Everything I've ordered from them has been a great product and they ship very fast. This cable was easy to terminate. The 1000' of cable comes in a box that is very easy to carry around and it is spooled so that you can pull out the length you need without any trouble or tangling. This was my fist time making my own network cable but the quality products and tools I purchased from made it easy! Great quality cable. I really wish I had this stuff on every install. Durable jacket strong shielding very minimal kinks during cable pulls easily identifiable twisted pairs when punching or crimping ends. If you're on the fence just buy it. From one tech to another you really can't go wrong. If you really want your cables to have that extra pop use white strain relief boots. Your customers will love it! I purchased the solid white... Have ran a few hundred feet so far and no issues. Boxs fall apart before you can even get to a job site. Pulls good after taping them up though. Cable is maybe 60/100 for quality but great for a cheap drop or two. This cable is SOLID copper not the copper clad aluminum that many cheaper products use. The solid spacer allows the cables can take a little bit more of a beating and twisting while running it through studs without risk of damaging the wires. I like the color selection I chose white which helps me differentiate my old blue Cat5e wires from this Cat6. The pull box worked great and had no snags while pulling. Excellent cable accurate product description quick delivery will use again whenever possible. Durable cable that cuts nicely. the replacement for Cat 5... nice white color... using it in 300 foot runs...and it doesn't miss a beat! 4.000Quality cable at a fair price! Solid Cat6 cable. High quality copper. Seems durable but yet it is very flexible and easy to install. For long runs make sure you have 2 people to ensure the cable doesn't kink. Like any Ethernet cable you kink it you've broken down the properties of the cable. High quality cable that does exactly what it should do. The twists and dividers look to be of spec too. I will buy this in the future if we need more. I have used this cable to build/create a number of networks. It has never presented a problem. Very good quality cable plastic core assures the wire is twisted consistently. I have worked w/less expensive cable but would not recommend using those cables. The only reason this gets 4 starts and not 5 is this - the white conductor for each of the pairs has a VERY difficult to discern color. This may sound inconsequential but when trying to pin the wire in an RJ45 end it's very hard to tell if you have inadvertently crossed white wires. The solid colors are the only ones that are very clear. Best people I have ever dealt with honest price not trying to lowball the price than rip you off like other places they are my new source they are great and the product was perfect more than I expected for the price. I'm doing a heavy remodel on my home and decided to replace my existing CAT5 network with CAT6. After shopping around I selected this cable primarily based on the feedback that others gave about its high quality. My remodel is still in progress so I can't yet comment on the data performance of this cable. I do know that the electricians and my A/V specialist both gave me unsolicited feedback that this cable was some of the best that they had ever seen. Finished project using this cable to create primary network in a large home. Cable is of good quality and consistent. Length markings made it easy to plan runs and know when to switch boxes. The wiring closet was terminated to patch panels with LAN runs blue sheathing Wi-Fi access point runs yellow sheathing Aux runs white sheathing and Camera runs Orange sheathing. Stacked on the rack are two switches one PoE for the cameras one regular for the rest - both 24 port and the router. Broadband POP is mounted to the wall of the wiring closet as is the satellite master lead for video. Also in the rack are the NAS unit server and UPS solution. Wiring testing showed all runs solid and operating at full bandwidth. Terminals at room are Keystone Cat6 and all network devices on LAN are GB LAN equipped. The speed of this stuff is just excellent when properly deployed. I was looking for something that was cheap money wise but was a quality product in the end. I don't have any specific Cat6 testing equipment but this wire carries gigabit ethernet speeds just fine even after long distances. You can definitely tell that this is a quality Cat6 cable the jacket is very thick along with the insides. As for the pairs being glued together I've found this not to be true and in my opinion is a plus for termination and the like. I have not had any pulling issues no kinks or anything with this box. Product arrived on time was as-specified White Cat-6 cable. It is marked every 2 feet which is sometimes nice to verify how much you fed down a conduit or how much to pre-cut. Cable appears to be nicely scuff-resistant takes terminations well and works. What else can you say? I hope I don't need any more but if I do I would purchase again. After a lot of deliberations as to which cable to purchase I finally decided on these cables for my whole home entertainment wiring. I have run these wires to each and every room of the house into a central entertainment rack in a basement room some runs rouhgly being 100ft plus in length. Let me be clear in that I have not yet added ends to the cable so am not sure how well they terminate or work but overall running was fairly simple. 2 of the 3 boxes purchased seemed to snag every 75 ft or so making it frustrating to pull the wires thus the 4 stars instead of 5 but overall was satisfied to this point. I will update once the house is finished and the wires are put to use. ** As an update I have started hooking up components and connectors and have had 0 issues with this cable. Ends terminate easily and there has been no loss of signal running HDMI IR signals and others up to 100 feet. Good product I would use it again. The box of cable arrived in good order and with good timing even though we are in a remote location. This cable was my first experience with Cat6. So far it seems much more durable than the Cat5e I've run in the past -- the plastic spline seems to give the cable significantly more substance. The cable was packaged in a box that easily fed the line as I ran it so no problems there. As for its performance over Cat5e I haven't had time to fully test this yet but given the price was only slightly more it seems like a no-brainer to upgrade. Bought this to re-wire my entire apartment with gigabit Ethernet. CAT6 is slightly hard to work with in general due to the extra shielding but I didn't find the material to be anything less than high quality and the shielding material wasn't overly rigid. I'd definitely recommend anyone who would like to take advantage of true gigabit speeds at a reasonable price to consider this product. I've only made a few moderate length cables with this brand but the cable feels nice in the hand and seems to be of good quality. I have used about 300 feet of this cable so far and it has been excellent. The cable hasn't gotten tangled in the box. The cable's length is numbered each foot so it's easy to find out how much you have left in the box. The 23AWG fits into regular ice boxes just fine although I am looking for some that have an open-end such that the cable can feed through them. I haven't actually tested the 10 gigabit speed yet but I wanted the cable that I install in my home to be ready for it when I find the need to upgrade my networking equipment. The cables are UTP with a thick white plastic separator that separates the pairs well and also has a small amount of plastic string. The cable is solid copper and stiffer than what a stranded cable would be. This is extremely good wire. Very well made and performs flawlessly. Cannot beat it for the price. Would recommend it to anybody. Quickly shipped and as promised. The 1000ft Bulk Cat6 Cable UTP Solid In-Wall Rated CM 550MHz 23AWG in White allowed me to compelte the job I was working on quickly and successfully. Have purchased other products and will purchase again! I purchased to do a pre-wire on my new house. I ordered 6 boxes three blue three white. Very easy to manage the different network runs with multiple colors. Not much else to say except that the packaging was good and the wires spooled out smoothly important when you're pulling six runs at once. 4.900Great quality red network cable. When I rewired our house for gigabit ethernet I wanted it to be easy to see and identify the new wires in the attic. Our attic has blown-in insulation and 30+ years of accumulated electric TV cable telephone and ethernet wires so I decided to go white for the gigabit ethernet. This cable has a plastic + shaped spine to keep the twisted pairs separate and neatly organized. I found the cable easy to strip without nicking the individual wires. The spine cuts easily with scissors. I do not have any complaints about working with this cable. This is good Cat6. The cable pulled from the box well no snags or twists. My 30-100' runs passed all tests. The sides of the box seemed a little flimsy. I would buy this again. I have had great luck with this cable and find it to be a good value. My only complaint would be the condition of the boxes when received. I have ordered more that 7 boxes total. I usually have to tape the box back closed so the spool guide does not fall out. This may be more of an issue of its over packing not being tight enough. The handle recess also tends to tear out very easily so maybe the box just needs to be heavier box. I purchased this brand cable in a couple colors for a network rewire. Cable shipped fast and when it arrived I was pleased with the quality. Would recomend this cable for anyone in a similar situation. Spool box was good quality as well never once did it bind up. 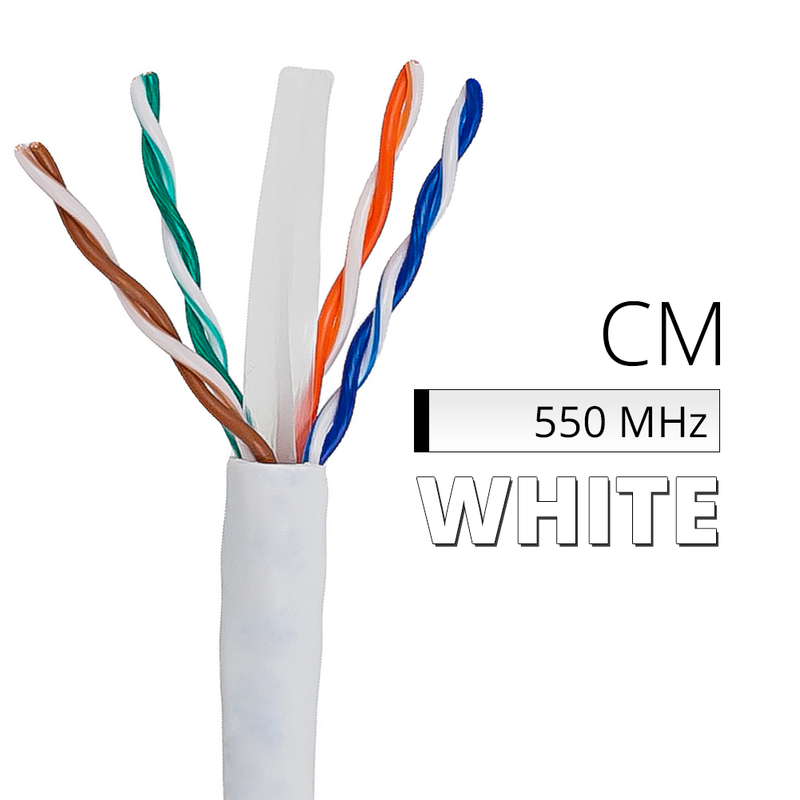 CM Rated Cat6 UTP Cable. Good construction distinguishes from gray Cat5e. Arrived on time in excellent condition. Easy to pull spool. The product I received is exactly as shown on picture. The quality of these white CAT6 cable is simply great works fine so far and no complains. Used this to wire my house. Product is of good quality. It is a nice feature to be able to choose which color the cable is. I would definitely use this same product again! My experience with my order is as always - very efficient and quick. Mostly I order by e-mail and then call if I have any issues or special requests.